Traditionally, Sapphire symbolizes nobility, truth, sincerity, and faithfulness. It has decorated the clothes of royalty and clergy members for centuries. 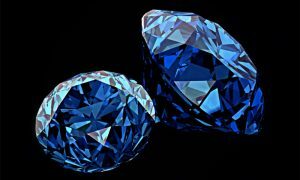 In 1881, a Sapphire was found at an altitude of 4500 meters in the Kashmir region, in a hard-to-reach area with continuous conflict between Pakistani Indians and local separatists. This discovery gave a start to intensive excavations that were conducted by quite primitive methods, but brought to light a legendary Kashmir Sapphire. Sapphire is the birthstone for September and the gem designated for the fifth wedding anniversary. This gift, so symbolic and so romantic, significantly boosted sales of Sapphires. When the word Sapphire is used alone, it indicates the blue variety of Corundum. When the color is mentioned as a prefix to the sapphire (yellow, pink, orange sapphire and so on), it is usually referred to as Fancy Sapphire. 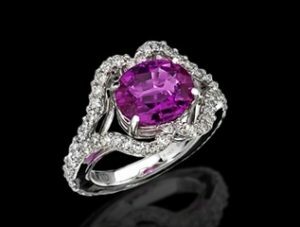 So if you find pink corundum, you can certainly call it Pink Sapphire, hoping it’s natural and as large as possible! 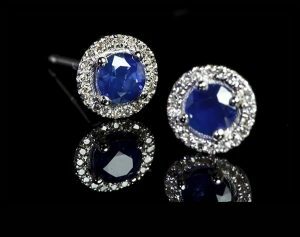 Americans are fond of Sapphires! Almost half of the Sapphires sold worldwide are imported from the United States of America. 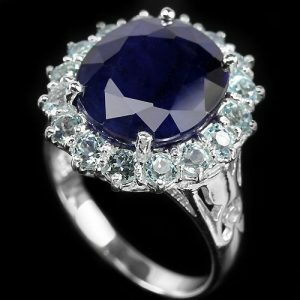 A leading exporter of Sapphires is Thailand, with average price of $30/ct, followed by India with average price of $8/ct. Despite the fact that India exports 8 times more Sapphires that Sri Lanka, Indian export of Sapphires is less profitable as the prices for Ceylon Sapphires exceed an average $100/ct. In 2010, the United States of America imported 1.73 million carats from Thailand at an average price of about $30/ct. In the same year the US imported only 13,700 carats from Switzerland, but at an average price of 1400 €/ct. But how many trade names are there to describe it? In addition to the Fancy Sapphires that may appear in a wide range of colors, there can be a variety of other terms to describe the Sapphires. 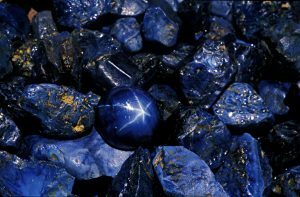 In addition to a legendary Kashmir Sapphire Gemstone we should also mention a Burmese Sapphire, Ceylon Sapphire, Pailin or Cambodian Sapphire, Kanchanaburi Sapphire, Thai Sapphire, Australian Sapphire, and we can’t fail to mention the much discussed Geuda and Dhum. The hardness of the Sapphire is a strong point of this Gem. It can withstand significant pressures and high temperatures without fracturing, since it has a hardness of 9 on the Mohs scale. Taking advantage of this excellent feature, the Sapphires are often mounted in rings that are worn in an area exposed to blows. Its superior toughness makes it a great choice for rings as they can take a stress of everyday wear. Among the recommended settings we would consider the solitary with prong setting, the three stone (trilogy) setting, and the Cluster (or Margarita).